I've been wanting to do a grizz for awhile. This painting is on 24"h x 48"w board. There are a lot of elements in this composition so it will take me awhile to paint. To start off, I just block in some colors. Here I've added in the basic shapes and started putting texture into the trees. I focus more now on the tree stumps, branches and bark. I've left the areas that will be covered with plants in the foreground. I feel that there are two subjects in the painting...one being a grizzley, but the other being this beautiful stump. 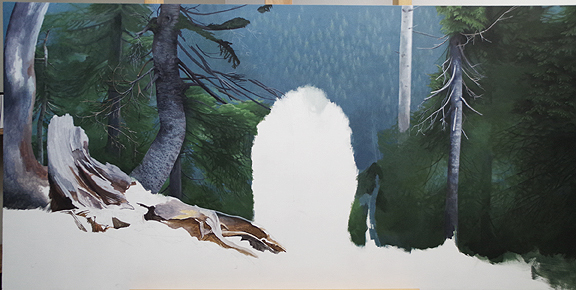 Here I've blocked in the main shapes and colors into the stump. I've finished the fine detail in the stump but feel I will probably touch up the highlights once the whole painting is almost in to make sure I've got the colors right. I started on the bear by blocking in the colors and direction of the fur. Second layer on the bear. I am working from back to front to work with how the fur layers itself. I will leave the nose and mouth till last. Don't mind the green tape near the foot of the bear, it is to mask off the stump while I go crazy with fur!